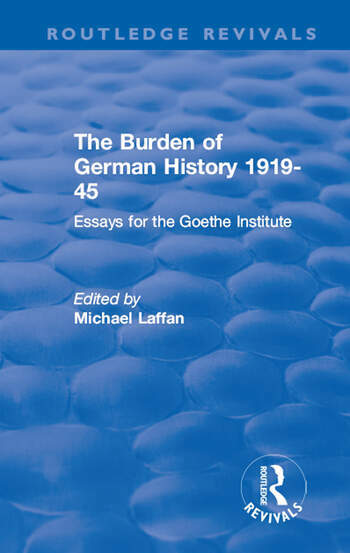 Originally published in 1988, The Burden of German History 1919-45 examines the vast literature surrounding Weimar years and the National Socialist tragedy, daunting even for the specialist historian or political scientist. The essays included in this volume provide an invaluable guide to research of the time and provides a stimulating review of a wide range of topics in modern German cultural, political, economic and military history. The essays are based on a series of lectures given by German and Irish scholars to a conference on the theme ‘Weimar Germany and National Socialism’, which was held in March 1986 in University College, Dublin, under the auspices of the Goethe Institute, Dublin. This book offers a significant commentary on a period of German history which included the exciting and ambivalent freedom of the Weimar society and the repressive, murderous uniformity of National Socialism.